Professor Kenichiro Itami and his coworkers at the Institute of Transformative Bio-molecules (WPI-ITbM), Nagoya University, have significantly improved the Nobel-prize-winning Mizoroki-Heck reaction and achieved a high efficiency environmentally friendly molecular synthesis. Their paper was published online in Angewandte Chemie, International Edition on July 20, 2013. Coupling reaction is of extraordinary importance in the efficient synthesis of two molecules. The Mizoroki-Heck reaction has been widely used to link molecules. However, despite the synthesis efficiency, the method has several weaknesses such as cost of the palladium catalyst and generation of substantial environmental toxins. It has long been anticipated that an environmentally benign coupling technique would be developed. Professor Itami has been leading coupling reaction development worldwide and previously developed a Nickel-Catalyzed C-H/C-O Coupling of Azoles with Phenol Derivatives in 2011 and Decarbonylative C-H Coupling of Azoles and Aryl Esters in 2012. 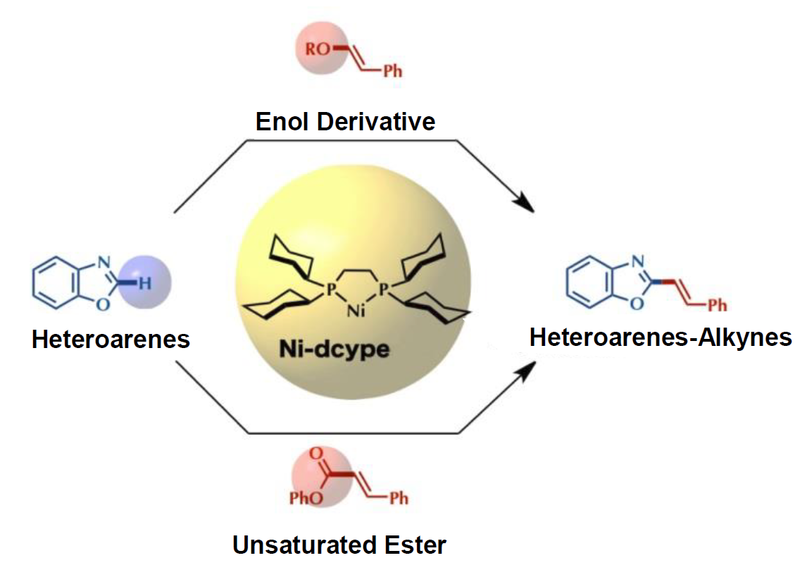 This time, using his Ni-Dcype catalyst, he succeeded in coupling heteroarenes and enol derivatives, or unsaturated esters, which was previously considered an impossible synthesis. The reaction is more practical than the previous coupling reactions, because it is environmentally friendlier, allows for a wider variety of molecules to be coupled, and has a decreased catalyst cost. It is widely expected that the development of the evolutionary catalyst will accelerate further research on system biology at ITbM. The nickel catalyst will be sold by the Kanto Chemical Co., Inc. in August 2013. This will contribute to research at universities and companies. 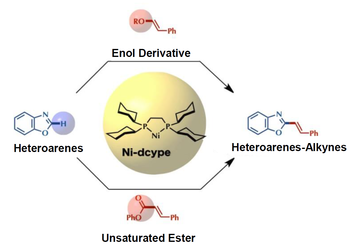 "The coupling reaction using nickel catalyst I discovered broadens the options for coupling molecules in synthetic chemistry. I expect that various substances will be generated using the reaction in the future."